Welcome to Legends Motorcycles web site. Legends Motorcycles Inc. celebrates 27 years of operation in 2013. We understand the pride and passion you have in your vintage motorcycles. After all, we own and ride vintage too. We spend a lot of time seeking out and offering to you obsolete parts and accessories, both OEM, NOS and replacements for a variety of motorcycles from British, European, Japanese’s and American motorcycle manufactures. This includes hard parts as well as items like tires for the look you need for your classic ride. We sell what we use ourselves. Feel free to ask for a tire recommendation for your bikes needs. Our parts on the web represent the type of products we sell. If you need something not shown please EMAIL us and we will reply with availability of other items. Calling will not always allow us the time to reply about the products so give us a chance to help you completely with an email. Check back often, as we will list new items as we locate a supply. Also check out our Ebay auctions for some of the unique and small quantity parts selections. You'll often find both used and new parts we have only one of listed there. Our owner has been involved with motorcycles since 1964. He has a passion for the older bikes and successfully raced in AHRMA vintage motocross to three national titles. 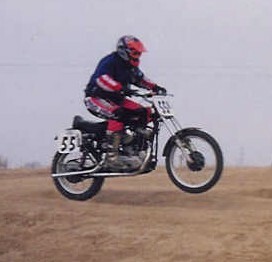 Two of those won competing on his 1965 Harley Sportster premier MX racer pictured above in full flight. With his collection of over 70 restored classic motorcycles representing makes and models from Aermacchi to Zundapp including British, Italian, American, German and Japanese he knows classics. Email him your questions, he will be glad to answer them. It's a problem for the classic bike builder. Repair or replace? Often the choice comes down to cost and hours. For some the thought of spending hours striping and repairing pales when the realization is your time is often harder to come up with the cost of replacement. That is why Legends sought out a supplier of shocks for the classic bike. Just like you we wanted a product that looks and serves the needs of a classic bike. We also know that the cost of rebuilding many old shocks far exceeds the cost of replacements. We offer these shocks in 12 3/4, 13 1/4, and 14 1/2 lengths. As with all our shocks when you place an order we will require what rider and bike weight is and then what purpose the shocks will be used for. This allows us to spring them for your applications. Shocks come with a set of mounting bushing and sleeves to fit most mounting bolt. 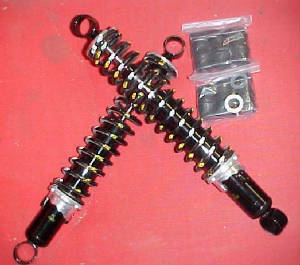 The shocks are five-way preload adjustable and both the shocks and springs are black for the classic era look. An affordable alternative for the vintage racer, restorer, rider. Email us for a quick reply on all our products.